Small brown bats are one of three types of bat that commonly inhabit houses. Bats in the attic? Once bats move into a house, or if you have bats in the attic, they rarely relocate, unless evicted using proper bat exclusion techniques. Here’s what you need to know to remove bats in the attic & make your building bat-free. Why do I have bats in the attic? Many Richmond Virginia houses often come with features rarely found in newer buildings – plaster walls, stained-glass windows, handcrafted woodwork, and bats in the attic. Like many folks, I don’t mind bats, but I don’t want them living in or on my home. Virginia homeowners often panic at the thought of having bats in the attic or other places in their home and try to remove a bat from their house with a fishing net and other improper bat removal devices. So when you find bats in the attic or in the gable end vents you should contact a Virginia wildlife removal company specializing in safe and humane bat removal and bat control. The bat experts you hire should also be trained in and follow NWCOA Bat Standards Compliant procedures when removing bats from your home or business. They will be able to determine if you have a bat infestation, bat problem, or a migrating bat colony and can explain how to get rid of bats in your Virginia home. When bats become houseguests in a Virginia home on a regular basis, it often signals an infestation that needs to be addressed. Bats are often attracted to older houses in Virginia because they offer so many potential entry points. Chimneys, cracks or holes in the siding or soffits, louvered vents with loose screening, separating flashing, and just about any place where materials have shrunk, warped, or moved apart will invite bats to enter and make themselves at home. Bats need just a tiny crack-about 3/8 by 1-to enter a house, and can squeeze through holes the size of a quarter. That’s not much space and is exactly why bat removal in the Richmond, Henrico, Midlothian, Chesterfield and Charlottesville areas of Central Virginia should be performed by a bat removal professional. Bats in the attic is the most common bat complaint we receive. While many people in Virginia fear bats (you certainly don’t want bats in the attic), the truth is bats are important to a healthy environment. They are extremely good at keeping down the bug population, with a single bat consuming about 3,000 insects a night. However, some species of bats in Virginia commonly roost in buildings today due to loss of natural habitat in the Commonwealth. Many people have a few bats in their attic in Virginia and never know it. But a large colony of bats can become a noise and odor nuisance. And bats should NEVER be allowed to enter interior living quarters of a home. Three species of bats in Central Virginia are most likely to find a warm old-house attic, wall, or soffit an irresistible roosting site: big brown bats (found in most of the US and Canada), little brown bats (Canada and northern US), and Mexican free-tailed bats (southern, western and southwestern US). A sizeable colony of big brown bats may total a dozen animals; for little brown bats it can mean several hundred bats in your attic. For Mexican free-tailed bats, a colony can number in the thousands. In Virginia, it is inhumane, usually illegal, and definitely impractical to kill a colony of bats roosting in your home. Eight species of bats are on the federal Endangered Species list, and Virginia keeps its own list of endangered bats as well. Even a bat species that’s plentiful across the entire continent can be protected in Virginia. Most endangered bats in Virginia are not house dwellers, but it’s extremely difficult for homeowners in Virginia to tell whether they have a colony of little brown bats, endangered Indiana bats, or, since they sometimes live together, a mix of the two. Not everyone whose Virginia home is occupied by bats or have bats in the attic decides to get rid of them. After all, bats are rarely dangerous – only about one to three percent of all bats in Virginia have rabies. Suppose you don’t dislike bats; you just don’t want to share your Central VA house with them. In that case, before evicting them, you might consider putting up a bat house or two at some corner of your property. That way, when the bats are unable to get back into your house, they’ll have the bat house as an option. The bats will have their house, you’ll have yours, and you can be neighbors. Think of all the bugs they’ll eat! Basic bat houses in Virginia can blend into any surroundings. One of the consequences of a successful bat eviction in Virginia is that all those of bats in the attic or displaced bats—the ones once living in the rafters of your home—will need a new place to live. 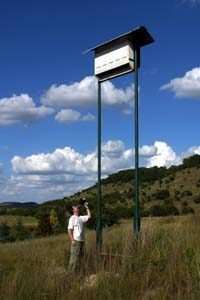 Installing a bat box on your property makes it easy for them to find one. Bat boxes can come in many shapes and sizes, but all have one thing in common: They are designed to provide cozy quarters for a colony of bats. From the outside, a bat house often looks like a large birdhouse—with one difference, entrance holes are at the bottom. Inside, all bat houses feature several crevices so bats can roost in layers. Installing a bat box in the corner of your yard gives newly excluded critters a place to go, while keeping them close enough to provide major insect control on your property. With a single bat consuming about 3,000 bugs a night, that’s a lot of FREE pest protection for your family. However, if you decide you just can’t stand the thought of sharing your Virginia home with bats in the attic and want the bats gone, first forget the advertisements for ultrasonic deterrent devices, mothballs, or aerosol sprays; they do not work and may be hazardous to your and your family’s health. 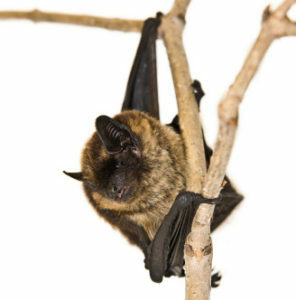 The only effective way to get rid of bats is to evict them from your home, a process usually called bat exclusion and a process best performed by a certified Virginia bat removal company. It involves locating, sealing and repairing bat entry points and installing bat removal devices appropriate for the particular situation of your home. No two bat jobs are alike. Potential customers often call complaining of bats in the attic and asking us, What does bat removal cost? We explain to them that an accurate bat removal cost can never be provided without first having a thorough bat inspection conducted of their property. Any bat removal company in Virginia giving you a price for bat removal over the telephone without having first conducted a thorough inspection of your home or business should be avoided like the plague. Also, you want to hire a Wildlife Removal Company NOT a Pest Control Company. They are two entirely different entities requiring different skills, training and equipment. Bat exclusion can be a big job, because there are potentially so many cracks and crevices that bats can use to enter your home. You never want to hire a bat exterminator; bats’ endangered status makes it illegal for exterminators to touch them, although it is not unusual to find companies in Virginia violating this law. It’s best to plan a bat exclusion in Virginia during the late summer or early spring because come mid-May, female bats begin giving birth to pups that cannot fly for several weeks. Bats in the attic are often there to raise their young. If you start eviction too early in the summer, you may be left with orphaned baby bats in your home, which couldn’t survive. We DO NOT typically remove bats from homes during Virginia’s bat birthing season except in extreme cases involving imminent health risk to the home’s occupants. In much of the country, house bats migrate in the fall to hibernate in mines and deep caves. If your bats have left for their winter quarters and you know where they are coming in, late fall is an excellent time to seal up the all exterior entry points and clean out the droppings. Not all bats migrate, however, especially in Virginia. And sometimes, they will hibernate in the house year round. You cannot evict the bats in the winter if they are still present, because they will not be able fly out while still in hibernation. Examine your house’s exterior in daylight, identifying any cracks or holes, then sit outside on a balmy, clear summer evening and stare at those spots, looking for bat activity. Be sure to watch each side of your house, since bats often have more than one entry point. Also, the entry points may have somewhat greasy brown marks around them comprised of a mix of urine, feces, and body oils. Our Virginia Bat Removal Professionals often look for these bat tracks or signs to help identify entry points. While there is a lot of information on the Internet for Do-It-Yourself Bat Removal, we DO NOT recommend that any homeowner attempt this process. You should also stay away from handyman types who lack the experience to do a proper bat removal in Virginia. Many times these individuals can end up killing the bats, driving them into the living quarters of your home or costing you more money to have the job done correctly by a professional Bat Removal Company in Virginia. Many legitimate companies often charge more to clean up the mess made by other so-called bat removal experts. After the bats have been humanely removed, their bat poop or bat droppings will need to be professionally removed and the area cleaned and sanitized. Bats have an extraordinarily keen sense of smell, and can sniff out the residual odor permeating from a prior roosting spot from miles away, so all bat dung must be carefully removed. Bat manure, bat feces, or bat guano, while apparently an excellent fertilizer, can contain a fungus called Histoplasma capsulatum. 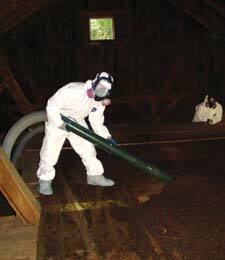 Proper precautions are necessary when removing and cleaning guano from Virginia homes. Our crew wears suits and masks, and uses a HEPA vacuum. Inhaling the fungal spores from these dropping can sometimes cause a respiratory illness in humans, this is why any removal of bat guano should be performed by a professional Virginia Bat Removal Company with the proper equipment to perform the job safely. Proper precautions are necessary for any bat guano cleanup to prevent humans from contracting Histoplasmosis—which can be lethal to some people. BAT REMOVAL. Safe and humane removal of all bats at the appropriate time. Under most circumstances, bats should not be removed during the bat birthing period. No gimmicks, bat devices, bat repellants, bat sprays, or bat fumigants have been proven effective in removing bats from your house, and some may be illegal in Virginia. Buyer Beware! SEAL UP AND REPAIR POTENTIAL BAT ENTRY POINTS. This is a very important step in the process of keeping bats out of your Virginia home or business. Bats only need an opening approximately 3/8” x 1” in size to enter a structure. 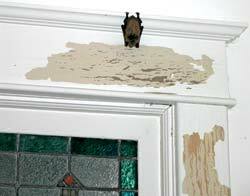 If your home is not thoroughly sealed, bats can and often do find these openings as they probe your house for vulnerable spots that will allow them to reenter the structure. BAT GUANO REMOVAL. Bat droppings are essentially dry and break apart very easily. Bat guano should never be swept with a broom or vacuumed with a normal shop vac. Contained within bat droppings are fungal spores that can lead to a respiratory illness called Histoplasmosis if inhaled. Safely removing these droppings require special equipment and protection for those cleaning up the guano. A paper respirator mask IS NOT proper protection. Histoplasmosis can be lethal to some people. This is why any bat guano removal should be performed by experts with the equipment and training to do the job safely. SANITIZE AND DEODORIZE THE AREA. If bats have been living in your home long enough, it is likely that you have noticed a foul odor created by an accumulation of the bat guano and bat urine. This smell can be overpowering and very unpleasant. Once the bats and bat guano have been removed from your Virginia home, we recommend sanitizing and deodorizing the area. Bats can sniff out the residual odors permeating from a prior roosting spot for miles away and we don’t want the odor to act as an attractant to other bats in the area. BAT BUG REMOVAL AND TREATMENT. Bat bugs are a parasite very similar to bed bugs. They can only be accurately identified with enhanced magnification. We have seen MANY cases where Pest Control Companies have misidentified bat bugs as bed bugs. Bat bugs feed on the blood of their bat host and can survive up to a year without a blood meal. Once the bats have been removed from your home it is important that any bat bug infestation be addressed as well. All bat colonies we have seen don’t have a bat bug infestation. In fact, most bat bug problems are found in very large bat colonies or in moderate size bat colonies that have been allowed to thrive and live in a structure for some time. WARRANTY. Legitimate bat removal companies in Virginia should warranty their work. Most companies offer a one year warrant with the option to renew your warranty annually for a fee. If a bat removal company in Virginia does not warranty their work, this should be a red flag and the homeowner should look to hire another Virginia bat removal company. If you have bats in your house and need to get rid of the bats in the attic, give us a call. We are the areas best bat exterminator in Virginia (we don’t really exterminate bats, they’re important to our ecosystem). Our local bat removal services in Virginia are provided from our offices located in Richmond, Henrico, Midlothian, Chesterfield, Charlottesville, Williamsburg, Newport News, Hampton, Norfolk, Chesapeake, Virginia Beach, Portsmouth, Lynchburg, Roanoke, Salem, Alexandria, Suffolk, Harrisonburg, Danville, Blacksburg, Leesburg, Manassas, Fredericksburg, Staunton and Fairfax Virginia. We also provide other Virginia animal control services including skunk removal, snake removal, squirrel removal, raccoon removal, and bird control in Central Virginia. Contact our Richmond office at (804) 729-0046 or toll-free at (888) 824-7383. We only use safe and humane animal traps and methods for wildlife removal.